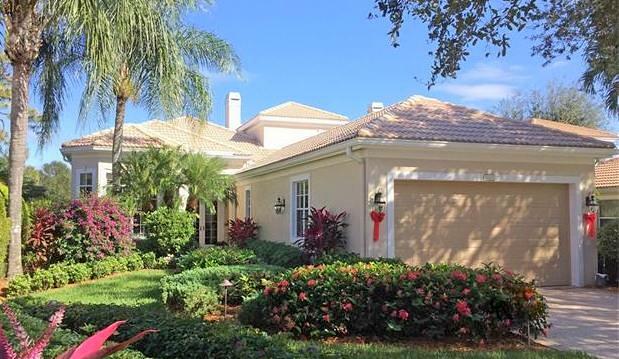 Kensington is one of the finest, gated communities in Naples. In fact, readers of the Naples Daily News voted Kensington as “The Best Private Country Club and Community of the Year in Southwest Florida” for three years in a row. Kensington’s 565 homes and built along and around the fairways of a Robert Trent Jones championship golf course. The magnificent 30,000 square-foot clubhouse welcomes residents and visitors as soon as they pass the guarded entrance south of Pine Ridge Road. Live oaks, palms, and banyan trees line the streets of the Kensington neighborhoods, each with distinctive home styles, architecture, and lifestyles. Four of the 12 neighborhoods are home to 1,700 to 2,800 square foot coach homes. There are four residences in each two-story building, two upstairs and two downstairs, in the coach homes in the Hamlet neighborhood. Other coach home neighborhoods include Westchester, Lancaster Square, and Wellington Place. Detached villas and single-family homes make up six neighborhoods, such as Sheffield and Yorktown. Floor plans start at 2,100 square feet and range up to 5,000 square feet. Each home has an attached two-car garage. The villas and single family homes are available in either three or four bedroom plans. Two neighborhoods, Knights Bridge, and Kensington Gardens, are reserved for larger, luxurious estate homes that are 3,000 square feet and larger and tend to be Mediterranean masterpieces with four or more bedrooms. The 6,879 yard, par 71 Robert Trent Jones Golf Course has hosted several PGA tournament events and has been a host qualifier course for the US Open Championship. However, Kensington offers much more than golf. The Kensington tennis facilities include seven lighted, clay courts. Four are American Red and three are Har-Tru. Because the courts are all Hydro-Grid with subterranean drainage, the courts are always open and ready for use after a Florida rain shower. Two certified tennis pros are on site for instruction and organizing tournaments. The heated, Junior Olympic-size swimming pool operates with a saline system to avoid problems common to chlorinated systems. There are wide, walk-down entry steps on the shallow end and lanes for laps at the other end. The Fitness and Day Spa features strength and cardio conditioning equipment. A personal trainer is available for individual attention. Facials and massages are also available from Kensington’s staff. The Spa also features a Pilates Reformer Studio. A certified Pilates instructor and four Reformers help residents to better health. Naples is all about fine dining. Kensington is also. Whether it is the elaborate Sunday Brunch, weekday lunch, or dinner, the Kensington Dining Room, the Mayfair Grill and the Chelsea Lounge feature expertly prepared and artfully presented creations to please any palette. Dinner entrees include selections ranging from Veal Marsala to that favorite of the Carolinas, Low Country Seafood and Grits. Of course, one does not live in Naples without enjoying all that Naples itself has to offer. One of Naples finest shopping venues, the Waterside Shops, is less than three miles west on Pine Ridge Road. Stop there on the way back from the beach. It’s on the way. The Naples Zoo, the Coastland Center, Fifth Avenue, and Tin City are each just a short drive, making Kensington an ideal community in which to live in Southwest Florida.